Many Avenues were planted around Tasmania commemorating both the dead and enlisted men from both the Great War and the Second World War. Use the Search block to jump straight to a description of an Avenue you are interested in. Planting a tree for Nurse Burbury at Jericho. During 1918 and 1919, many communities around Tasmania created "soldiers’ avenues", "avenues of honour" and "memorial avenues" to commemorate the dead and acknowledge the efforts of those who had enlisted for service during the Great War. It is not clear how the movement began but certainly the State Branch of the RSSILA (Returned Soldiers' and Sailors' Imperial League of Australia) was prominent in Hobart’s avenue first suggesting the planting in 1917. They also promoted it generally around the State. The idea for local avenues came from a variety of local organisations: sometimes the local council, more often the local tourism or progress association and often a special local committee. Many were supported and entirely funded by subscription (donations) though in many places local councils provided either trees or timber for tree guards. Most involved placing nameplates on the individual trees or tree guards. In terms of placement, there is a great variation. Those of the Southern Midlands such as Dysart and Kempton flank the entrances to towns along the main highway from Hobart to Launceston. Most are inside towns again flanking the main road. Others such as Beaconsfield and Scottsdale flank roads to other local towns while Westbury and Ringarooma chose reserves as the position. From what little is known, locals often cared for the trees for many years. Most had some form of nameplate. The departure of families from districts, the decline of the generation that knew the men and changing priorities spelt the end for many avenues. The very nature of the avenues also worked against them. They were private memorials in a public space and with the creation of monuments as the primary focus for public remembrance, the private family commemorations around trees were often overlooked. In the Avenues of Honour (with trees planted for all those enlisted), returned soldiers would often visit their tree with a sense of pride even when no longer resident in the district. A road trip commonly included a visit to the tree. The disappearance of nameplates due to age or as souvenirs reduced the trees to anonymous items in the landscape. Over time there was a slow loss of meaning: lack of separate avenue signage, generational change in councils, council amalgamation, road work and the general decline of small towns or the growth of suburbs all helped in the process. However there are still those who remember these trees and can identify for whom they were planted, some are still the focus for very private and poignant acts of commemoration. FOSW has begun a State-wide Avenues Project supported by a grant from the Tasmanian Community Fund. The first stage involves research on these other Avenues through a combination of Council records, contemporary newspapers and magazines as well as Australian War Memorial files. The second stage involves creating a How To Kit for local communities based on our experiences with the Soldiers Memorial Avenue in Hobart. Our partners in this include the Royal Tasmanian Botanical Gardens, which will provide technical and botanical sections for the kit as well as providing tree assessments on identified avenues to help planning for their restoration or replacement. The selected communities will receive direct presentations, follow-up consultations plus phone and email support. The aim will be to produce restoration plans by November 11th 2006. The original kit will then be reviewed in the light of this practical experience for distribution to other communities. Research is still underway. The following list includes avenues for which there is documentary evidence as well as those identified by local memory. Those for which there are documented descriptions are marked with an asterisk. The list is not comprehensive. Some pines exist near the old teachers house at the corner of Dillon’s Road. A replanting near the Alonnah War Memorial and Oval is planned. Arbor Day was observed at the local state school on Friday in delightful weather. Pinus insignis trees were planted and dedicated to the memory of Sergeant Arthur F Adams MM (died of illness on December 7 1918), Pte Percy A Adams (died of wounds on May 24, 1916), Pte J F P (Frank) Murphy (killed in action on June 7,1917), Gunner Olaf E Ohlson (died of wounds on February 26, 1917) and Pte Thomas O Ohlson (killed in action on September 4, 1916) soldiers of the district who paid the supreme sacrifice in the great war, the last three being old scholars of the school. A similar tree was planted to the memory of the year 1920. No longer exists , basically disappeared with the town. A large gathering of people assembled at Apsley last week to plant an avenue of tress in memory of soldiers who have enlisted form Apsley. Eighteen men have enlisted, three of whom have made the supreme sacrifice, namely Corporals Douglas Brown and F. Ibbott and Private Higgins. The Warden (Mr A.A. Reid) addressed the gathering after which the trees were planted. Afternoon tea was served by the ladies. Some trees remain in the church grounds but these are unmarked. Difficult to identify trees which are original and some later planting. A large gathering of residents and people from all parts of the district, including the Warden and Mrs Rigney, assembled by the invitation of the rector (Rev T Taylor) in St Thomas’ Church to be present at an interesting function on Monday afternoon, when eight trees were planted as a soldiers’ memorial avenue each side of the road leading to the church. The state school scholars marched to the ground, and sang tow patriotic songs in a way which reflected great credit on their teachers (Mr. and Mrs Stewart). The proceedings opened with the hymn “Remember Lord.” The rector then gave an impressive address, and paid a warm tribute to the lads who had given their lives for justice and right, eight of whom were natives of Avoca, and ex-scholars of St Thomas’ Sunday school. The death roll has been very heavy for so small a community. Many touching scenes were witnessed as the trees were planted by the parents and relatives of the fallen heroes, the names of whom are: Sergeant Lewis McGee VC: Lieutenants P Fowler and King: Privates R Sale, J Parker, B Ayers, V Adams, Len Shelton, Harold Shelton (brothers) H Stanley, A Stanley, B Denaley [sic probably Delaney], W Conway, H Malkin, J Wright, L Grant, C Fletcher, J Gillies. The proceedings closed with the National Anthem. Afternoon tea was provided by the ladies. This Avenue was removed in the 1980s due to the age of the trees and tight planting against houses. On Saturday afternoon tree planting in memory of fallen soldiers took place, and many people attended to help. Trees were planted along the main road in Upper Bagdad. The ladies served afternoon tea, which was very much appreciated. Bagdad, Southern Tasmania. August 26. Monthly meeting was held on Saturday. Mr. French asked permission to plant memorial trees on the Barrington-road. Mr. Hope said that while trees were a worthy memorial to our fallen soldiers, there was a probability that they would eventually damage the roads. The Warden said as the year was advanced for planting, the matter would be considered in time for next season. Some of the trees remain on the northern route out of the town. Local action has ensured the survival of the remaining trees within the town. They are not individually marked in any way. Beaconsfield was en fete on Saturday afternoon, when a soldiers’ avenue of trees was started toward Beauty Point. The Beaconsfield Progress and Tourists’ Association received the first donation of £5 from the Hon. T G Collins MLC when the idea of the avenue was first mooted. It is hoped to have a memorial avenue of five miles. At the ceremony on Saturday the Hon. T G Collins, Mrs Collins, and Miss Collins were present. After luncheon at the hotel the Beaconsfield Band serenaded the visitors (Mr. Collins is patron of the band), who appreciated the compliment very much. Appropriate speeches were made by Mr. W E Kerrison (chairman of the association), the Warden (Mr. Freeland). Mr. Collins, who received an ovation, spoke in acknowledgement of the very kind reception given him; he was proud indeed to take part in a function organised to do honour to the brave men who had left their homes to fight for King and country. The trees were planted by relatives of the soldiers who had enlisted from the municipality. Mrs Lyall (whose husband is a prisoner of war), hon. secretary of OAS and prisoner of war funds, had organised afternoon tea, and with numerous assistants to dispense the good things £4 was realised for the fund. Mrs Freeland accompanied the Warden, and the Hon H Hayes MHA and Mr. M J O’Keefe MHA were also present, and took part in the proceedings. The Beaconsfield Progress and Tourist Association some time ago had under consideration the question of tree planting. The Hon. G T Collins gave £5 and it was thought that this kindly action had made it possible to carry out the idea of planting an avenue of honour, to be called “Soldiers’ Avenue.” The council has from time to time planted trees from Blythe’s Creek and the south to nearly the centre of town, and at the northern end to Brandy Creek, the old town boundary. The ultimate intention is to continue planting till Beauty Point is reached, and when that is done there will be an avenue of between four and five miles. The trees already planted are planes. The association decided to plant 50 trees from Brandy Creek to Beauty Point, and it was agreed to make the occasion worthy of the object. Amongst those present were Hon. G T Collins, Mrs and Misses Collins, Hon. H Hays, MHA, Mr. M J O’Keefe MHA, the Warden and Mrs Freeland. A very nice compliment was paid to Mr. Collins after lunch at the Club Hotel. The local band, of which Mr. Collins is the patron, played a selection in front of the hotel. Mr. Collins was very pleased. The procession was then formed at the South African war memorial, the order being – The B B Band, returned soldiers, cadets, State School Band, state and convent school children, Salvation Army Band, motors, and conveyances of all sorts. The sidewalks were crowded, and almost everyone in the town turned out. At the site the scene was very animated. Streamers across the road, and from numerous flagpoles, made a very effective picture. Mr. W E Kerrison, chairman of the Progress Association, said that, although the association had charge of the proceedings, they could not claim all the credit. Mr. Collins’ generous donation had made it possible to carry out the idea of planting an avenue to the memory of those who had gone to the front from the district. Mr. W R O’Toole had kindly given timber to make 25 guards, and the town ward members had assisted in preparing tree holes, etc. They were greatly indebted to these donors, as well as to the Beaconsfield and Salvation Army bands. Mr. Nightingale, who had arranged for a combined choir, and others who had assisted. The secretary (Mr. W H Allison) had done a great deal of work to make the function a success. He was proud to see the returned soldiers present, and extended a very hearty and cordial welcome to the visitors, especially Mr. Collins, who had done so much for the district. From the spot they were on a view was obtained of the river, down which many steamers had carried many lads on their way to the front. Some had returned wounded and broken, whilst some had paid the supreme sacrifice. To those families whose sons would not return he offered his deepest sympathy. Referring to the trees they had adopted the plane oak as typical of the men who had gone to the front. He then invited the Warden to reside, and the proceedings were opened with the National Anthem. The Warden congratulated the association for its splendid work. He rather felt that it was a pity the council had not taken up this matter. He was pleased to see the returned soldiers present – men who had been fighting alongside their allies. They had received splendid news lately and they had no doubt as to the result of the war. Whether it ended soon or later we would win. Referring to the war loan, Mr. Freeland said the quota for the Beaconsfield municipality was £9500, a large sum, but he felt sure if they all united they would raise it. The committee had arranged to call on every one to do their part, if only to take up a £10 bond. They must have men to carry on the fight, but they also must have money to pay and support the men. He urged all to assist in raising their quota. The Beaconsfield Band played a selection in excellent style. Mr. Collins, who was received with loud applause, wished first to thank the band for their very kind reception on his arrival. It was a credit to the town. He had represented them in the Legislative Council for 24 years, and was proud to be present to do honour to those men who had left to fight for their King and country. They were fighting for the right of small nations to live. They were not fighting for an increase in territory, but so that the world might be a fit place to live in. (Applause.) Their men were fighting alongside of their allies, and they stood on an equality with the best troops in the world. The deeds of the men of Gallipoli should be written in letters of gold. His son had written to him about the opinion the French people had of the Anzacs. When our men were being forced back the French people had to fly for their lives, but when the Australians came these people went back to their homes, confident that they weer safe. Surely those who remained behind would be prepared to do their part. He referred to the splendid work being done by the women of Australia. He instanced the grand work of the Red Cross, OAS, YMCA and other bodies, who were doing their utmost to provide comforts for our men. He was here to do honour to these men, and they could not do too much for them, and on their return they must be provided for. Referring to the war loan, he said they could not carry on the war without money. Those who had money must do as the Americans were doing – give, give, give. He urged them to subscribe to the loan. It was not a gift, but an investment, that would be repaid. Tasmania had challenged West Australia, although the latter had 100,000 more people to draw upon, and he had no doubt they would do their part in helping. He concluded by wishing Beaconsfield every success. Mr. W Hutchins called for three cheers for Mr., Mrs., and the Misses Collins, and these were lustily given by the great crowd. The choir sang “O God, Our Help” and then Mr. Hayes spoke, expressing his pleasure at being present at the planting of the trees to perpetuate the memory of the brave men who had gone to the front. Mr. O’Keefe joined with the other speakers in doing honour to those brave lads who were upholding the traditions of the British race. He was proud to be an Australian – proud to be there to uphold the Union Jack of old England. What they wanted at the present time was unity, and they must have it if they wanted to live. They must have men, but the wealthy must be prepared to make greater sacrifices that they had in the past. They must have money to carry on the war. Flag-waving was no use. They wanted something more than that, and the people with the means must be prepared to do more. He sympathised with those parents who had lost their sons. Not only must the men who had returned be provided for, but the parents who had given their all should not be forgotten. The trees were planted by mothers, fathers, and friends of the men who had enlisted from the municipality and who will see that the trees are properly cared for. The whole … was a great success, and the crowd was delighted with the prospect of having an avenue of honour right to Beauty Point. No doubt effort will be made to plant another section as soon as possible. The ladies’ committee of the OAS and Prisoner of War Fund arranged afternoon tea… had a cottage and gardens for tea rooms. The secretary, Mrs Lyall, (whose husband is a prisoner of war) was assisted by a band of ladies. The proceeds amounted to about £4. This Avenue has since been restored in a slightly different position and was rededicated on Remembrance Day 2018 by the Mayor of Clarence, Doug Chipman. Details may be found on the Council website. The planting of an avenue of trees at the rifle range, which ceremony was postponed from the previous Saturday on account of heavy rain, took place on the 7th in the presence of a large number of people. The avenue was in honour of members of the club who had gone to the front, 23 out of a total of 60 members had gone, two of whom had been killed. Mr H H Facy, captain of the club, asked Major Morrisby to address the gathering before the planting began. The major made a very good speech, which was appreciated by all present. The holes for the trees had previously been prepared and the trees placed ready for planting; they were marked with the names of the solders in whose honour they were planted. Many relatives were present, and planted trees themselves, others being planted by Dr Hayward, Mr Facy, and some of the visitors. Guards have been put up to protect the trees. Great credit is due to the club members for the work they have put into the range. The ladies provided afternoon tea. In the evening an entertainment was given, when the trophies won during the past year were presented by the president (Dr Hayward) and Major Morrisby. The hall was crowded. Songs and recitations were given and supper was served by the ladies. The proceeds of the entertainment are to go towards the funds of the miniature rifle range at Bellerive, which is now being constructed. There was a large gathering on Saturday afternoon at the Bellerive rifle range to witness the planting of trees to form an avenue of honour of those members of the club who have volunteered for active service during the present war. The Inspector of rifle Clubs (Lieut. Sanders) and Mrs Sanders were mongst those who went over from Hobart, and evinced a lively interest in the proceedings. Mr H H Facy, captain of the club, asked Major A Morrisby to address the gathering before the actual work began. Major Morrisby said the trees to be planted would represent the members of the club who were now or had been at the front in this great war, and now numbered 23 men out of a total of 60 members. This constituted more than a third of the membership, a percentage, he believed that had not been exceeded by any country rifle club in Tasmania. Of the 23, two Private Herbert Lazenby and Private A Edwards, had made the supreme sacrifice. In planting the avenue they were helping to mark an event that would form no mean portion of the history of Tasmania, and show to future generations the part their boys had taken in the affairs of the Empire, and in assisting to vindicate the rights of the weak and small nations. He urged them to continue to do all they could to assist in the prosecution of the war, which they could do in many ways. The visitors were then invited to the entrance of the rifle range, where the first tree was planted. All the holes had been previously prepared, and the trees (Macrocarpa) placed beside them. The trees were marked with the names of the soldiers in whose honour they were planted. Many of the relatives of the men were present and themselves planted the trees. Other trees were planted by the president of the club (Dr Haywood), the captain (Mr H Facy), members of the club, and visitors. The members of the club (who turned out well) set to work with a will, and while the planting was going on others pt up guards, a quantity of sawn timber having been provided, while others fastened wire around the guards, the more effectively to protect the trees. Splendid work was done by Mr James O’May and his son, Mr E W O’May (secretary of the club). The former was the practical man, and mainly attended to al the details of the tree-planting, while the latter was everywhere when there was work to be done. After the trees had been planted, the ladies, who had mustered in great force, dispensed afternoon tea. Work was then resumed, and all the trees were guarded and wired, and the names added. In the evening an entertainment was given in the Bellerive Institute, when the trophies won during the past year wee presented by the president (Dr Haywood) and Major Morrisby. The room was crowded. Several songs and recitations were given by Messrs McVilly, N Ford and others, after which dancing was indulged in. Supper was provided by the ladies. The proceeds of the entertainment were in aid of the funds of the Miniature Rifle Club range, which is in course of construction. On Saturday the tree-planting in connection with the soldiers’ avenue took place, in the presence of a large and representative gathering. Amongst those present were the Premier and Mrs Lee, Mr. J H Freeland (Warden) and Mrs Freeland, Councillors TC Archer, C Titmus, C Herbert, Geo McQueen, R G Stokes ad Mrs Stokes. Mrs S Freeland (mother of the Warden) made a special trip from Launceston to the place of her childhood days some 70 odd years ago, and was heartily congratulated by many of her old friends on being able to be present. Trees were planted by the Premier, Mrs Lee, Warden, and Mr. T C Archer, each giving an appropriate address. The Longford state school drum and fife, under Mr. F J McCabe, head teacher, supplied a number of selections, which were much appreciated. Canon Wilmer moved a vote of thanks to the Premier and Mr. McCabe, which was carried with cheers, also for the returned men and the boys at the front. The Bothwell Avenue was removed in the early 1990s due to the age and size of the trees. The species chosen as a replacement was Japanese Maple. There is no indication that the trees are at all significant and there are no individual nameplates. The ceremony of planting the first tree in Bothwell’s Avenue of Honour took place this afternoon in the presence of a large and representative attendance. The proceedings opened with the National Anthem by the Bothwell Band.The Warden (Mr. A A Reid) explained that the Avenue was being planted as a fitting memorial to those brave men who had risked their all for King and country. One tree would be planted for every man enlisted from the district with the name, rank and unit inscribed on a copper plate on each tree guard. He was pleased indeed, the tat he avenue was an accomplished fact, and that in years to come they would have something to show what their soldiers had done. He introduced the Premier (Hon W H Lee) and thanked him for his attendance. The Premier said it gave him very great pleasure to take part in the ceremony of planting the first tree in the Memorial Avenue to Bothwell soldiers. The people were to be congratulated on the very high spirit which prompted them to perpetuate the memory of the men who had answered the call of King and country. Bothwell had done remarkably well in the number of men, 108 to date, but he was sorry to see that the percentage of casualties was somewhat heavy: 27 brave fellows had made the supreme sacrifice, which tinged the ceremony with sadness. They had laid down their lives for the great principle for which the Empire and the Allies were fighting, and all ought to be thrilled with gratitude to these men and ever honour their memory. One of the finest things was the magnificent spirit of self-sacrifice of the mothers: and , although many sons had made the supreme sacrifice. The mothers counted the sacrifice not too great if it helped the Australia to retain its privileges. Thirty–six Bothwell men had been wounded, one was a prisoner; and 19 had returned. He spoke of the duty of the Commonwealth and State Governments and citizens to see that the wounded men on their return were fittingly provided for. He was pleased to find that no less than four Bothwell men – Percy Hirst, Vincent Geard, Thomas Evans, and Roderick Swindells – had won the Military Medal for bravery in the field. They ought to be very proud indeed of these men, and their names ought to be held in the very highest esteem by the people of the district because of their brave deeds and the honour conferred upon them. Thee trees were to be planted in commemoration of the loyalty and devotion of the em who were prepared to sacrifice all for Empire. They were fighting for Australia to preserve that priceless heritage maintained by the British flag and the British Empire against the aggressive militarism of Germany. He hoped there would never come a time when anyone would think that Australia was not worth fighting for. He referred to certain conferences at which resolutions against continuing the war and in favour of making peace had been passed, and said that while Germany was guilty of outrages and atrocities there could be no talk of peace. When men talked of peace before Germany was beaten such men could have no respect for their country or for those who had fallen. They might as well stretch out the had of friendship to a robber who had entered their house, outraged their women and carried off their possessions. Yet thee were people who were talking of peace without reparation. What sort of peace did such men think that Germany would give now? God forbid that this should ever come as long as we had men and money to wage the war until a triumphant victory was won. He appealed to the manhood of those present to offer their services for King and country. The war was not finished, and might last a considerable time, and the cry was for men, and still more men. It was up to Australia to see that its army was properly reinforced, and to help keep the old flag flying. He hoped that the ceremony that day would remind eligible man of their responsibilities, and that some would say, “ We are going to our part, and have trees planted in our honour.” The Premier concluded by saying that he had been asked to appeal for the Red Cross. Large sums had been given, and they could not do better than give more to help the magnificent work of the Red Cross. He was pleased to see the local Town Hall almost covered with house badges, and heartily congratulated the people of Bothwell on the amount raised. He urged them to still purchase more badges, and continue the good work. Lieut. E E Jones said he held a brief for the men in the trenches and those who had already given their lives for their country. He felt that the places where the trees were to be planted, being in commemoration of men who had fallen, were sacred ground, but the message he was going to give was also sacred. There could be no better idea than the planting of trees in memory of their soldiers, and as an emblem of their sacrifices. The lives of many were ended, but in giving their lives they had planted the tree of freedom. They should think, every time they saw the trees, that all had a duty, and that no duty could be done without sacrifice. When men stopped to count the cost, they already failed in their duty. Every men knew, and must recognise the call of duty, and that they were fighting for justice, freedom, the purity of their women, and all things they were taught to hold dear. They were opposed to an enemy who cared nothing for what methods he used, however brutal, as long as he could win, and if he did win he would trample everyone under his feet. He urged men to come forward and do their duty if they were fit, and if they were in doubt about their fitness, to come and let the doctor decide. He described how men had to go back to the firing line not properly well owing to insufficient reinforcements and said that for this reason many died of wounds who might have been saved if they had been fit. Those who were eligible and remained at home were actually the murderers of these men. They were killed, not by Germans, but by those who could, and would not, relieve them. The referred to the number of young boys going into camp, while big strong men saw them off and attended dances. He could not understand why these men would not answer the call of duty. He knew that Bothwell and Tasmania had done well, but while there were men left they had not done well enough. He concluded by appealing for Red Cross funds, and urged all to give for the sake of their lands in France.The Premier again spoke, and called for cheers for the men at the front, while the Warden called for cheers for the Premier. The initial step in planting the avenue of honour took place on Wednesday in splendid weather. The attendance was large and representative. Proceedings opened with the National Anthem by the Bothwell U.A.O.D. Brass Band, under the baton of Mr. G H Dalke. The Warden (Mr. A A Reid) explained that the avenue of honour was being planted in recognition of the patriotic offer of the men who had gone froward to risk their lives for their country. Mr. Reid said that one tree would be planted for each soldier who had enlisted from the district, with the rank and unit inscribed on a copper plate, and attached to the guard around the tree. The Warden called on the Premier (Hon W H Lee) to address the assemblage. Mr. Lee expressed his great pleasure in being present to participate in such a great function. He congratulated the residents on their spirit of never ceasing to forget the memory of the brave lads who had answered the call of their country. He alluded to the fact that Bothwell had enlisted no less that 108 men to date, and out of that number 27 had made the supreme sacrifice. He emphasised the fact that it was the duty of the Commonwealth and State Governments to see that the men on their return were fittingly provided for. He referred to the deeds done on the battlefield by the Bothwell soldiers: he found that out of the number who had gone forward no less that four had received the Military Medal, namely, Privates Percy Hirst, Thomas Evans, Vincent Geard, and Lance-Corporal Roderick O Swindells. The Premier appealed to those present who were eligible to come forward and do their bit, as it was up to every eligible man to keep the Australian Army properly reinforced in its endeavour to keep the old flag flying. The Bothwell Town Hall was almost covered with Red Cross badges, which showed that a large amount of money had been raised. The Premier at this stage proceeded to plant the first tree – one to the memory of Private Athol Clyde Blake, who was the first soldier to offer his services to the Empire from Bothwell. Lieutenant Jones, recruiting officer for Denison, delivered a stirring appeal for recruits, and during the course of his remarks explained the position of affairs, as he knew them from his own experience. He concluded a very sensible address by calling on the young men present to seriously consider their obligations to the Empire and come forward, right away if possible. Proceedings terminated with cheers for the men at the front and the Premier. The crowd then moved off to the Town Hall, where the Red Cross people were in attendance with refreshments. Proceedings were enlivened by the presence of the Druids’ Brass Band, which played appropriate airs during the function and at the Town Hall. Bothwell, Southern Tasmania. July 8. On Saturday afternoon, on the Bracknell Recreation Ground, memorial trees were planted and dedicated to the memory of the fallen soldiers belonging to the district. For a small place the death-roll had been fairly heavy, and it was generally felt that this would be a fitting way of commemorating the services given by these men to their country. The gathering was large and representative, added interest being given to it by the presence of the Premier and Mrs Lee. The proceedings opened with the singing of the hymn “O God, Our Help in Ages Past.” Mr. G Pitt paid a warm tribute to the fallen men, and introduced the Premier, who received a very cordial welcome. Mr. Lee appreciated the honour of taking part in such a gathering, and expressed his sympathy with the relatives of the fallen men, that there be no slackening of effort until victory as achieved. The Revs R S Morris and A Holloway also spoke. The first tree, in honour of Private Colin Saunders, son of Mr. and Mrs J Saunders, who fell in the landing at Gallipoli, was planted by Mrs Lee. Other were then planted by relatives in honour of Privates T Ross, Jas. Scott, E H Bradmore, A Chadwick, A Lyons, J Masters, D Cross, Sergeant L J Saunders, Privates A C Taber, L Saunders, A Leonard, and L Cooper. After cheers for the returned soldiers present, and the men at the front, the proceedings closed with the National Anthem. Afternoon tea was provided by the ladies, the proceeds being directed to the Red Cross funds. Remnant trees exist flanking the old road from Breadalbane through to Youngtown. Interest in the Soldiers’ Avenue in the district of Franklin Village continues to increase, the avenue being now extended to Breadalbane. On Saturday afternoon there was a busy scene whilst 30 trees were planted and guarded. In order to expedite matters the committee members had dug holes for the trees during the forenoon, so that the actual planing was quickly accomplished. Mr. Dean had charge of the proceedings, and on the arrival of several carloads of soldiers from the Base Hospital, the ceremony commenced. Mr. L Atkinson, MHR, spoke in the highest appreciation of the avenue as a memorial for the boys who had answered the Empire’s call, two of whom, Roy Dean and Harold Chugg, now slept in the solders’ graves n France. Mr. Atkinson planted the first tree. Some of the soldiers and many other helpers soon competed the labour of love. Afternoon tea was served in the school-room, where flags of the allies, branches of the Cootamundra wattle, and bowls of violets were used effectively as decorations, During the tea hour much pleasure was given by Mrs Geoffrey Grubb and Miss Eileen Kildea, who contributed songs. The National Anthem was lustily sung by the company. Through the kindly donations of cheques from Messrs. L Atkinson, MHR, D Viney (Warden), Councillors Hughes, J Atkin, Mr. R J McKenzie MLC and the promise of other assistance, the committee will continue the avenue at an early date. The soldiers’ avenue committee consisting of Messrs Dean (chairman), [obscure] R Hughes, Geoff Grubb, [obscure], Lloyd Hughes, J Conacher, S Hogarth and W Matheson[obscure] met on the [obscure]. A cheque from the Hon. R McKenzie MLC was received with thanks. It was decided to have the tree-planting on the 20th June, when about 40 trees will be forthcoming. Enthusiasm is rife and the ceremony should be most interesting. The past phase of tree-planting for this season came to pass at Breadalbane on Saturday, when twenty trees of various varieties were added to “The Avenue.” Fifty-seven trees have contributed to this section, twelve of which now grace the green, where they make a pleasing contrast to its former array of briars and rubbish. Tree-planting has caught on firmly here. Last week the committee met to discuss the balance-sheet and other matters, and it was decided to continue operations next year, when doubtless the same fine enthusiasm will be evinced. Votes of thanks were unanimously accorded to Mr. Dean, the redoubtable secretary; Mr. Conacher, marshal of guards; and the ladies, who provide the inevitable and acceptable afternoon tea on each tree day. On Saturday the Breadalbane village was en fete, the occasion being the inauguration of this section of the Soldiers’ Avenue. in the forenoon the committee dug holes, and had everything in readiness for the afternoon ceremony. The arrival of car loads of returned soldiers from Launceston Base Hospital was the signal to get into action. Mr. L Atkinson, MHR, expressed his admiration of the idea of the Soldiers’ Avenue, which was a beautiful tribute to the lads who answered the Empire’s call – two of them, Roy Dean and Harold Chugg, sleep in soldiers’ graves in France. The Warden (Mr. D Viney) also expressed sympathy with the proceedings. Mr. Dean marshalled his forces, and , after, the planting of the first tree by Mr. Atkinson and some soldiers, merry squads in which each family in the district was represented, and aided by some of the boys, soon had thirty trees entrenched and well guarded, Mr. Conacher’s business-like guards being quite a feature of the occasion. Afternoon tea was set out in the schoolroom, where the allies’ flags and masses of Cootamundra wattle. There are some large pines to the right boundary of the hall but most have succumbed age or pressured of space. Some months ago it was decided to plant trees at Bream Creek in honour of the soldiers who have gone to the front and on Friday, July 12, this plan was carried out with great success. The trees were planted in the grounds of the Bream Creek-hall, and consist of pines of various kinds, and English tree, put in alternately. There are 24 trees, one for each family, whose sons are doing their bit, and representing 36 men in all. Great interest was shown in the planting. When all the work was done, afternoon tea was served in the hall. Afterwards a short meeting was held, and a committee of nine appointed to manage all welcomes and farewells to soldiers of the district. Recently Bream Creek Show Ground was a hive of activity. A happy crowd of relatives and friends of the Bream Creek soldiers were there planting trees. The land in the vicinity is very poor, so loads of soil had to be carted in which to plant the trees. After the work was finished, workers and visitors were invited to afternoon tea in the hall. Note that the two descriptions differ in their descriptions of the exact location of the trees. This may due to error or changes in the standard descriptions of the area: the two sites as they exist now are not adjacent though not distant from each other. An extensive Avenue this has all but disappeared. Some replacement trees have been planted along the foreshore from Wivenhoe to Burnie but this work did not involve any conscious restoration of the original purpose. Yesterday afternoon a fair number of residents assisted the Tourist Association in planting 68 trees on the beach side of the road between Emu River bridge and Wivenhoe railway crossing. The planting was for the dual object of serving as a memorial to the local boys who have taken part in the war and giving the main artier to the town a pleasant appearance. Mrs Chatwin, who has lost one son out of here at the front, planted the first tree, and Mr. O G Norton (Warden of Emu Bay) addressed the gathering in terms appropriate to the occasion. About 40 additional trees will be planted, probably next week, to complete the stretch, and the association is hopeful that a fitting title for it will be chosen before the work is finished. Last August it was resolved to perpetuate the memory of all soldiers who had enlisted at Burnie by planting a tree to which would be attached a metal disc bearing the name of a solider. The necessary holes were dug but suitable trees were not obtainable; the work would be proceeded with on the sea front at Wivenhoe, where the residents had promised to care for them. Soldiers’ Avenue That portion of the main road from the Wivenhoe station to the Emu Bridge will be shortly known as the Soldiers’ Avenue in memory of soldiers who have enlisted from the Emu Bay Municipality and Wivenhoe in particular. The Tourist Association have the matter in hand, and working bees at the Fern Glade have cut 300 posts and 800 pickets for the tree-guards. In addition to this post it is proposed to plant 20 soldiers’ trees at West Beach, making 150 for this year. On Saturday week it is proposed to plant the trees, ad put guards up by means of a working bee. Parents of soldiers will be invited to take part in the planting. A party of enthusiasts whose pleasure on Saturday afternoons lies in the improvement of the fern glade intend spending next Saturday afternoon on the esplanade at Wivenhoe putting up guards ready for the trees which are to be planted later on as part of the scheme to keep evergreen the memory of the soldiers who enlisted from Emu Bay. This stretch of road will be known as the Soldiers’ Avenue, after a little ceremony, which will take place on the day of the planting, and the trees will bear the names of Wivenhoe soldiers in particular. The trees have not yet come to hand, but further information on the part of the scheme will probably be available at the meeting of the Tourist Association this evening. On Saturday afternoon, a large gathering assembled at Wivenhoe, the eastern entrance to Burnie, when an avenue of trees was planted to commemorate the memory of fallen soldiers and others who enlisted at Burnie. The Warden (Mr. O C Norton) made a suitable speech, and in conclusion congratulated the residents of Wivenhoe for offering to look after the trees; and implored them to teach their children to reverence the trees, as each one of them was planed to the memory of a hero. The honour of planting the first tree was allotted to Mrs Chatwin, one of the oldest residents of the district, and the mother of three soldiers, one having given his life. The scene was an impressive one, men standing with bared heads during the planting operations, which took place under a fluttering Union Jack. Many mothers were observed weeping when cheers were called for our splendid men. Relatives were handed a numbered tree, and under the supervision of several experts 97 out of 100 trees were planted before dusk. In several instances trees were planted opposite the houses in which the lads weer born. The movement was organised by the local Tourist Association. This body is to be congratulated, as it is believed to be the fist avenue to be completed in Tasmania to the memory of our soldiers. The ladies of Wivenhoe provided the workers with afternoon tea. Soldiers’ Trees The West Beach presented an animated scene on Saturday afternoon when tree planting in commemoration of our soldiers was continued by the Tourist Association. Similar work was conducted by members at the River Emu. The Burnie Tourist and Progress Association met on Tuesday night. …. The Soldiers’ Memorial Avenue had been completed, 165 trees having been planted and protected by three-sided guards. The secretary was authorised to allot numbers to relatives, numbers corresponding to trees to commemorate soldiers hailing from the municipality. The original Avenue was removed in the late 1980s. A replanting has taken place thanks to the efforts of the local community particularly Jim Haas. The residents of Cornwall recently, through Mr. S Trinder, approached Mr. J Allan Guy, MHA, with a request that he endeavour to arrange with the Minister for Lands for an area of land on the township to be reserved for the purpose of tree planting in honour of the fallen soldiers. Mr. Guy has now been informed by the Secretary of Lands that an area of about two acres required by the residents of Cornwall will be reserved for the planting of trees, as requested by Mr. Trinder, on payment of the survey fee of £2 10s 6d. The district surveyor has recommended that the reserve be made, but states that a survey will be necessary. Removed in the late 1980s. said he was sure he voiced not only the feelings of his brother councillors but also of the whole of the Cressy people , when he took it as a great honour and pleasure that the ceremony should be opened by our own member , and he the Premier. the planting of the avenue would be a lasting tribute to those fallen soldiers who so gloriously died for their homes and the Empire, and ling monument to those brave fellows who return. Any relative or friend of any fallen soldier might on application obtain possession of any certain tree, and by taking care of it and affixing a tablet dedicate it to the fallen hero. The Premier, after expressing this gratification at being able to conduct the ceremony, said the planting of the avenue would mean the perpetuating of a lasting and glorious memorial to those gallant heroes of the district who had gone forth to fight shoulder to shoulder with their blood brothers of the British Empire, not only for the liberty of the devastated, hun-ravished Belgium, the LIBERTY of AUSTRALIA but the liberty of the whole world. Mr. Lee planted the first tree, while the band played “Onwards Christian Soldiers.” After this an adjournment was made to the hall for afternoon tea, which was presided over by the wife of the Warden (Mrs J Freeland), assisted by many local ladies. The hall, which was prettily decorated, had been arranged by Misses Miller, Sykes, and Nita Mason, and presented a very charming sight. Besides the Warden, other councillors present were: - Messrs C Titmus, W Brumby, T Archer, A Stokes, and E W Lawrence. On Saturday afternoon Cressy was “en fete” the occasion being the planting of the Soldiers’ Avenue. Beautiful weather prevailed, and added much to the afternoon’s pleasure. Flags were flying from almost every residence and business place in the main street, while the large Union jack belonging to the state school floated from the top of the Town Hall. At 2.30 the school children, headed by their fife and drum band, left the school grounds, under the head teacher, Miss Miller, and her staff, playing patriotic airs. After marching through the main street they were lined up in the front of the hall to await the arrival of the State Premier (Hon W H Lee) and the Warden of Longford (Mr J Freeland), who arrived by motor at 2.45, accompanied by Mrs Lee and Mrs Whitefield. The Warden, in welcoming the Premier to Cressy for the purpose of planting the first tree said he was sure he voiced not only the feelings of his brother councillors but also of the whole of the Cressy people , when he took it as a great honour and pleasure that the ceremony should be opened by our own member, and he the Premier. The planting of the avenue would be a lasting tribute to those fallen soldiers who so gloriously died for their homes and the Empire, and ling monument to those brave fellows who return. Any relative or friend of any fallen soldier might on application obtain possession of any certain tree, and by taking care of it and affixing a tablet dedicate it to the fallen hero. The Premier, after expressing this gratification at being able to conduct the ceremony, said the planting of the avenue would mean the perpetuating of a lasting and glorious memorial to those gallant heroes of the district who had gone forth to fight shoulder to shoulder with their blood brothers of the British Empire, not only for the liberty of the devastated, hun-ravished Belgium, the liberty of Australia but the liberty of the whole world. Many of those brave men had laid down their lives. They would not return to see this living monument of green trees, and it behoved every eligible young man who was fit and capable of service to go to those now fighting against such odds so that some of them at least might return to see this memorial. If, as we know the truth, that Australian battalions were now being verged [sic] into Imperial ones for want of reinforcements, how could we hope for that return, especially when we now that many of them had been constantly fighting for close on four with practically no rest whatever. Would not this thought appeal to some of the young men of the municipality and induce them to go forward and hang together, and die together, until German militarism was crushed? America had come to our assistance. What if she had not? Australia and every true Australian must stick to the promise made. Only by doing that could our battalions be kept intact and our honour upheld. Another war loan would shortly be issued, and the promise made would be so kept. Those were the loads the men of Australia must carry; the women were doing great work, in particular, the Red Cross. People would be more generous to this cause if they fully realised the great work done and how much more was needed. On the 21st, when an American tea would be held in this hall, the funds would go to the French Red Cross. This could be our mite to that great ally’s noble cause. The Warden proposed a vote of thanks to the Premier; also to Miss Miller, which was carried with applause. The Premier responded on behalf of Miss Miller and himself. Mr. Lee then planted the first tree, while the band played “Onward Christian Soldiers.” After this an adjournment was made to the hall for afternoon tea, which was presided over by the wife of the Warden (Mrs J Freeland), assisted by many local ladies. The hall, which was prettily decorated, had been arranged by Misses Miller, Sykes, and Nota Mason, and presented a very charming sight. Besides the Warden, other councillors present were:- Messrs. C Titmus, W Brumby, T Archer, A Stokes, and E W Lawrence. From information gleaned from Mr. Freeland after the planting had finished, it was learned that all the cost of the trees is borne by the council, and not as some imagined by public subscription. Many workers made light labour, and the sixty trees were planted and guards erected before 5 o’clock, and a pleasant send-off accorded to the Premier and Mrs Lee, who were motored to Longford by Mr. C Titmus, this being rendered necessary by a double blow-out of the tyres of the Warden’s car – a Premier and a Warden had proved too weighty! Sweets and cordials were distributed to the children, and were the gift of the Warden. This Avenue was recorded in local municipal records and a number of trees remained though unmarked. A replanting of 5 trees took place in 2006 courtesy of the Southern Midlands Council. Its commemorated enlisted men and flanked the old Launceston Road from the Church toward Constitution Hill. Still well preserved and maintained. At some point a sign listing the names of those commemorated was installed. The Avenue flanks “Avenue Rd”. On Friday trees were planted here by the sides of the road leading from the post office to Donaghy’s mill, in commemoration of those who had fallen in the great war which is now going on in Europe. The day was a wet one, but despite the weather there were visitors from remote districts, including Mr and Mrs Pitt and Rev Hutchinson, form Hamilton, Mr and Mrs Dean, Mr Shoobridge, Mrs Parker and others. The trees were planted and a guard placed around each. Short speeches were made by several friends, and the group dispersed to the Temperance Hall, where a sale of articles was made on behalf of the OAS and prisoners of war funds. A substantial sum was realised, which will benefit the two funds named to the extent of eighteen pounds each. Considering the inclement weather, this was a very good amount, and great credit is due to the members of the committee who arranged the function. The avenue of trees in honour of them who have enlisted from Ellendale was planted on Friday, August 23. The Warden and Mrs Pitt, Mrs parker OBE and a large and representative gathering of Ellendale people and visitors from the surrounding district were present. Proceedings began with hymn “O, God, Our help in Ages Past.” The Warden then introduced Chaplin Bethune, of Claremont Camp, who spoke of the men at the front and of those who had made the supreme sacrifice. Corporal R O Shoobridge spoke for the Returned Soldiers’ Association and urged men to enlist. He said he had been compelled to come home severely wounded, but would return to the front as soon as the doctor pronounced him again fit for active service. The Hon. Ells Dean followed with a stirring recruitment speech. The National Anthem was then sung, after which the Warden called for three cheers for the King and the men at the front. The Rev. A E Hutchinson called for three cheers for the men who had not gone, but would go. These were heartily given. The parents and relatives of the men who had enlisted planted the trees for the fallen, namely, Privates Angus Holmes, James Bentley, Alf and Arthur Clark, Gordon heron, and Henric Nicholas. Mr. R O Shoobridge, as a returned soldier and a mate of Henric Nicholas, planted a tree to his memory. Trees were also planted in honour of the other 17 soldiers who had enlisted from Ellendale. A gift afternoon was held in the Temperance Hall in aid of the OAS and Prisoner of War funds, at which the excellent sum of 37 3s was netted. The stallholders were Mesdames Rolls, Cashion, Cook, and Miss Saunders, with Mrs Rayner as secretary and Miss Saunders as treasurer. The funds were greatly augmented by raffles. The sheep, band note and goose were returned by the winner, and sold to help swell the funds. A dance was held afterwards in connection with the gift afternoon. The Hamilton Council at its September meeting decided on letters from the hon. secretaries of the soldiers’ memorial tree planting committees at Ouse and Ellendale, to accept the gift of the trees and guards at those places and that they be under the protection of the council. We have a memorial avenue of horse chestnut trees, opened in 1918. We propose to erect a Litch gate for the gun to our public recreation ground within which we will place the gun on brackets. Cost of gate £10, money raised by entertainments and subscriptions. We propose to pace the gun in the State School if it arrives before the gate is finished as we have no other public buildings. We have planted Oak Trees on the Recreation Ground and Fixed tablets to the Trees of those that fell at the front. We have a Honour Roll in the Hall under this we have decided to place gun. A ceremony that created a large amount of interest took place at Franklin Village on Saturday afternoon when the Premier (Hon H V Lee) planted the first tree in the Soldiers’ Avenue, which is to extend from Franklin Village to Youngtown. There were many people present. Mr C Kelly acted as spokesman in introducing the Premier, whom he asked to plant the first tree in memory of Private W Hyde, the first of the boys of the village to make the supreme sacrifice. The tree had been given by Mr C B Grubb. In subsequent remarks the Premier offered sincerest sympathy to the parents of the late gallant soldier, and said that whist they mourned the loss of a son they were soothed in a degree by his noble death in so great a cause. Mr Lee also spoke of the splendid response the district had made in the call to arms by sending every available man between the ages of 18 and 45 years. In complimenting the residents upon devising the splendid scheme of a soldiers’ avenue of trees the Premier mentioned that he had been informed that King’s Meadows and Breadalbane had decided to have an avenue each. This would link up several miles along the road, and he hoped in the future to have the pleasure of driving in the state motorcar through an avenue extending from Launceston to Hobart. The Hon R J McKenzie MLC agreed with the premier relative to the north-south avenue. He would also like to see the north-west with a soldiers’ avenue. Mr McKenzie applauded the people for thus honouring the men who had volunteered for service, and urged them to use their endeavours to induce others to enlist, so that the stain on Australia’s honour might be wiped out in the matter of the disbanding battalions. In all 36 trees were planted before dusk crept on, and to each was nailed a Union Jack. Mr and Mrs Kelly, “The Hollies”, entertained the Premier and Mrs Lee and the Hon R J McKenzie and Mrs McKenzie at afternoon tea. In the school hall afternoon tea was dispensed to everybody. The soldiers’ avenue of trees (started about a month ago at Franklin Village) is now completed between Young Town to Relbia road with the exception of two trees yet to be planted. The residents of these villages on the Hobart road have been most energetic in their work, and have surely set an example for others to follow. It is a beautiful idea to perpetuate the memory of the soldiers who have made the supreme sacrifice for home and country. Also is the idea splendid in being the means of proving our appreciation of the brave boys who are fortunate in coming home again. A busy band of workers kept going until dusk on Saturday afternoon, and tea was provided by Mesdames Kelly, Hyde and Luck. The avenue will be a grand asset to the public highway, and in the days of peace (to which we look forward with heart yearning), when the horrors of war will be but a memory, Tasmanians will have this splendid memorial to show travellers form many lands, who in years to come will visit our island state. Infants of today (the men and women of the future) will tell to the strangers the story of the memorial avenue. [Description continues of honor roll ceremony]. B W Steel Acting Secretary, 28/11/1920. A plan to erect a memorial avenue of trees at the approach to St Mary’s Church of England, Gretna, was confirmed at the annual meeting of parishioners. The rector of Macquarie Plains (the Rev T B McCall) presided. The idea was formulated by a former rector (the Rev K J Hughes) now stationed in Burnie. The proposed scheme is to plant trees next year when the church reaches its 99th anniversary. They will be placed in a avenue formation outside the church gate and each tree will be in memory of a well-known Gretna family. They will be cared for by members of the families they commemorate. The following committee was formed: Messrs McCall (chairman), T B Ayre, J S Adams, E A J Cannell, Mesdames O Geard, R D Rainbird, and F G Downie. Private George Rory Sullivan, Otago Infantry Brigade (New Zealand), killed in action, 3rd December, 1917. The National Anthem was then sung and the meeting dispersed, a great number, including the Warden and councillors and council clerk, Archdeacon Whitington, Lieutenant Jones, and the returned soldiers, proceeding to Ouse, to take part in a similar function there later the same afternoon. The Hamilton Council has accepted the gift of the trees and guards and will see to the maintenance of them. Tasmania cannot lay very much claim to beautiful roads, but within a few years we will be able to claim that at least four of the many hundreds of miles of highway are “just like St Kilda Road.” I refer to the new road being built from Berriedale to the Hobart Bridge. This new entrance to the city will be 150ft wide, compared with the average of 60ft for highways throughout the State, and will provide two traffic lanes with a centre-line of trees. It was pleasing that the Servicemen’s Parents and Wives’ Association decided at its annual meeting this week to plant trees in the centre and on either side of this road in memory of men who lost their lives in the Second World War. They are endeavouring to obtain a complete list of names and plant a tree in memory of each man. Besides beautifying the road, this seems a worthy method of commemoration. Plans have been made for a memorial avenue along the boulevarde being constructed as a new northern outlet for Hobart. This was announced yesterday by Mr. G Limb (State president) and Mr. R Hudspeth (Hobart Branch president) of the Servicemen’s Parents and Wives’ Association. They have been assured by the Treasurer (Mr. Brooker) of Government support for the scheme. Mr. Limb said that it was proposed to plant a memorial tree for each Southern Tasmania servicemen who lost his life in the Second World War. The memorial would be for those from districts from Oatlands and south, and Queenstown. Cenotaphs, community centres, and other forms of memorials had an excellent purpose, but they commemorated servicemen collectively, he said. A tree planted for each fallen servicemen would be an individual tribute and a living and lasting memorial. A fund of £130 was already in existence, a public appeal probably would be made later. Mr. Brooker had been sympathetic to the plan and had undertake to obtain the names and other details of those for whom the memorial was intended. The trees probably would be planted at a special Arbor Day ceremony, and it was hoped that maintenance would be undertaken by the Government, municipal authorities, and possibly by relatives of the fallen. The scheme is in the hands of a committee consisting of the Lord Mayor (Mr. Osborne), Ald J E Cuthbertson, Messrs G Limb, I V Thornicroft, J M Firth, W Colwell, F Chilvers, J Walker (Launceston) and Miss M M Somerville. Trees to perpetuate the memory of Huon serviceman who died in the Second World War probably will be planted along the Huon River foreshore. The Huonville Servicemen’s Parents’ and Wives’ Association decided to recommend this at its annual meeting on Tuesday. It was also agreed to assist in the beautification of the river reserve by providing seats. The Huon Council is to be requested to renew the names on the Soldiers’ Memorial near the Huonville Bridge. The War Memorial Committee is to be asked to make provision for an honour roll to be built in fronting the street on the proposed war memorial at Huonville. The memorial will take the form of a child welfare centre. Officers elected: President, Mr. C V Dave; vice-president, Mrs K Page; secretary, Mrs V Pitt; treasurer, Mr. C A Cox; auditors, Mesdames R R Emmett and C P Skinner; committee, all financial members. Memorial Road planned. Funds raised by public subscription. The residents of Kempton gathered together last week to plant an avenue of trees along principal in the town to the memory of the soldiers who have gone from there. A busy scene was enacted, when men, women, and children engaged in the work. An engine, lent by Mr Goodwin, was used for cutting the timber into the required length. The work could not be completed owing to the shortage of timber. It is expected that about thirty trees will be planted. Memorial street trees planted after the First World War at Kempton and Melton Mowbray are to be heavily cut where they encroach on the Midlands Highway. The Green Ponds Council Clerk (Mr. R C Raymond) said at the council meeting yesterday that the district highways superintendent (Mr. R B Pitt) had stated that the trees would have to be trimmed back from the highway and reduced to a height of under 18ft. Complaints had been made about the trees encroaching on the highway. It had been suggested that the trees be removed. Cr H D Hallam said he would oppose the removal of the trees, which were planted in memory of individual soldiers. He suggested that consideration be given to planting another row of trees on the inside of a fence adjoining the highway. When the new trees were established the present trees could be removed on one side of the road. It was agreed to invite tenders for the trimming the trees. At a service at the Memorial Hall, Kingston on Sunday afternoon trees were planted in memory of former members of the Kingborough sub-branch of the Returned Servicemen’s League. The Rev V H C Gill dedicated the Memorial Avenue where trees in memory of deceased members of the first executive sub-committee of the Kingston sub-branch were planted. The members were Messrs B Mason, G Douglas, J Rollins, D Fogarty, and V Donovan. Undated Mercury held in AWM N/C279 Clippings. By appearance it would seem to be from the 1950s. Trees will be planted along the driveway to Launceston’s War Memorial to form a memorial avenue. The trees should be planted within four weeks. The chairman of the War Memorial Community Centre Association (Mr N A Findlay) announced the project yesterday. The trees will be planted on both sides of the driveway leading from High St to the War Memorial Hall. Pillars of stone and wrought iron will be built on either side of the driveway entrance bordering High St. The pillars will be lighted to give them added effect at night. Mr Findlay said that the association had asked the Launceston City Council for approval of the scheme. The council’s general committee would recommend the scheme to Council. The association’s objective was to improve the entrance to the War Memorial Hall. The association would approach specified number of patriotic and service associations. Each would be asked to donate a tree. A plaque bearing the donor’s name would be attached to each tree. Mr Findlay said that the Council had improved the Windmill Hill reserve to where it had become one of the city’s most popular rendezvous for citizens and tourists. The improvements to the reserve combined with the attractive city baths building and the memorial hall would be enhanced by the avenue and entrance pillars. “The new imposing entrance and the memorial avenue will greatly add to the dignity of it all,” he said. Agreement with the Launceston City Council on the Memorial Avenue on Windmill Hill was reported at the final meeting for the year of the Launceston War Memorial Community Centre Association. The Council will erect two light standards at the High St entrance to the avenue to carry the required plaques, together with two circular flower beds and a low stone kerbing about nine inches high. The association will bear the cost of this work and the Council will install and maintain the lighting and the flowerbeds. The association considered this a very satisfactory arrangement. Twenty-one patriotic and service organisations have agreed to carry the cost of the memorial trees which have already been planted. The association will conduct an official opening and dedication of the avenue, followed by a function in the hall, when the Council has completed the work. The Launceston City Council and the War Memorial Community Association have agreed on the cost and design of lighting of the proposed war memorial avenue at Windmill Hill. This was announced at the final meeting for the year of the association. The council is to erect light standards and plaques at the entrance to the memorial drive of trees and to construct flower beds around the trees. The association if to pay the cost of the construction and the council will maintain the lights and the flower beds. More than 20 patriotic and service organisations have agreed to pay the cost of the trees already planted. The balance indicated that revenue from the rental of the hall this year will be £1,182 - £300 up on 1960. The memory of the 98 old boys of the Launceston Church Grammar School who laid down their lives in the Great War, has been kept sacred by the great honour board and the magnificent chapel at the school, and will be kept fresh and green in the minds of scholars by an avenue of trees and shrubs planted on Saturday afternoon. The trees, obtained as seedlings from Gallipoli’s famous heights, were nurtured and tended through the difficult early stages by Launceston florists and gardeners, and now, as fresh and strong young plants, will, it is hoped, grow into a fine memorial avenue. “They shall not grow old as we that are left grow old. Age shall not wither them, nor the years condemn. Wish tree planting every success. One of the finest things the school has done, and a most beautiful way of keeping fresh and green the memory of the old boys who fell in the Great War. Colonel G Harrap, acting chairman of the School Board, said that it was a very happy way of perpetuating the memory of those old boys, and he hoped that the trees would be a fine avenue of memory in 100 years time. Mr. K M Douglas( R A Adams), Miss M Allen (M J Allen), Mr. H P Ritchie (C R Balderson), Mrs A Bennett (R H Bennett), Mrs Black (A H Black), Mrs Challis (G D Challis), Miss Cheek (W M Cheek), Mr. R L Anderson (J S Cranswick), Mr. R M Douglas (M Douglas), Mr. G M Eddie (M H Eddie), Mr. F R Evans (F R Evans), Mrs Gidley (J Ferguson), Mr. M H Hirst (A Y Flexmore), Major A A Evans (S J Game), Miss M Gatenby (L F Gatenby), Mr. Angus McKenzie ( R H Harrison), Mr. E Hart (R A Hart), Mr. C Hinman (A G Hinman), Mr. T Hutchinson (A J Hutchinson), Mrs T D Room (W R Jones), Mrs Compton (J H Lade), Miss J Anderson (R Latta), Miss von Bibra (K S Mackay), Mr. W McGowan (S McP McGowan), Mr. A J McKenzie (C T Parker), Mrs Parry (A W Parry), Mr. G P Pinel (P J Pinel), Miss N Riva (J E Riva), Mr. Robertson (G T Robertson), Mrs T K Robson (K T Robson), Mr. E Eberhard (G T Sams), Miss Compton (V L Sams), Miss Sampson (W H Sampson), Mr. Mills (C F Sharland), Mrs E E von Bibra (A Shields), Mrs F Reed (E L Smith), Mr. A Sorell (E T Sorell), Mr. E E von Bibra (E L von Bibra), Mrs Evershed (G G Woodhill). Other fallen men for whom trees were planted were:- A Ainslie, J A Ainslie, F Allison, G B Bailey, C C Barnard, C F Boothman, E G Brain, V P Collins, F N Collins, W A Connell, R L McR Field, J A Foster, S S Garrard, L Y Gutteridge, W E O hales, G F Hall, K C Hall, L G Holmes, C R Irvine, B Kerslake, E B King, W H Krushka, E Lawson, G G Lewis, I S Margetts, H W McBean, A Rae, G Miles, P J Morgan, H C Nicholas, C A Parker, J E Peacock, J G Pearson, W C Reycraft, A V Ridge, A Sale, C F Shapira, J B Scott, R Sherwin, L B Solomon, L Tariton, B L Taylor, W Thompson, G B Todd, D D Viney, G Walken, J Webster, V G Westbrook, T J Woodhouse, C N Wright, and J B G Youl. At the conclusion of the ceremony the school entertained the visitors to afternoon tea in the school dining-hall, and many persons took advantage of the opportunity of inspecting the new school chapel. Jericho, in common with most places, decided to plant a number of trees to perpetuate the memory of the brave lads who have left home to fight for freedom. The day proved favourable, with the result that there was a nice gathering, apart from the relatives concerned. A number of people journeyed from Oatlands, thus showing a patriotic spirit, and the function proved so successful that Jericho residents are to be congratulated. The number of trees planted was 27, and it is gratifying that a small place like Jericho had that number of patriotic young men willing to shoulder the rifle. The first tree planted was for Captain Graham Bisdee, this duty being performed by Mrs Alley. Prior to the planting Warden Lester addressed the gathering, complimenting the residents on patriotism. He also embraced the opportunity to draw attention to the forthcoming war loan, and appealed to his hearers to assist to the utmost. Afternoon tea, supplied by a bevy of ladies, was nicely laid out in the hall, proceeds being in aid of the Red Cross circle. Information to hand tells of a tree-planting function fixed for Friday. The day “the tank” is expected to arrive. A meeting of residents interested, recently decided to plant ten trees in honour of that number of local soldiers who had fallen in battle. To aid the project the municipal council has granted the sum of £5, as in the case of a similar effort in George Town. It is estimated that £10 will be sufficient to carry out the scheme. Saturday tree-planting function in honour of 11 local soldiers who have, in Gallipoli ad France, made the supreme sacrifice for Empire and justice, was efficiently carried out by a committee of ladies and gentlemen elected earlier in the week. Willing workers having dug the holes for the trees on the previous day, the planting became a comparatively easy task. The first tree, placed in position by Miss Eva Lee, was in memory of her brother (Gunner David). The Rev Mr. Kelly feelingly referred to the fallen soldier himself, and to the bereaved relatives. Mrs Jones, after planting a tree in memory of Machine-Gunner Alf Tarrant, spoke of the dead soldier as sone who knew him well. The next tree, planted by Mrs Yard, was in honour of Private A H Tarrant, brother of the previous soldier. The most touching incident happened when Mr. Gilham, much broken, held in position the tree in honour of his son (Private Arthur H Gilham). Rev Mr. Kelly, as on the previous occasion, gave a sympathetic address. Mr. Gilham also planted the tree dedicated to the memory of QMS Val. Allison, the first soldier to succumb, Mr. Pratt responding. Gunner Cecil Richardson was next named, his aunt (Mrs Popes) planting a tree. Trees in memory of the brothers, Corporals Cliff and Charles Bickham, were planted by Misses Iris Kitto and M. Tearle respectively, Mr. Dazeley speaking on behalf of the young ladies. Private J Cannon was similarly honoured, Miss Mackey being deputed to plant his tree, testifying that her father (Trooper Mackey) to the fallen soldier’s excellent character. Trooper Mackey also planted a tree to perpetuate the memory of Signaller Charles H Jenkins. Mr. Dazeley, as a club comrade, was able to testify to the intelligence and keen sightedness of that soldier and his skill with the rifle, beside his cheerful and generous disposition, stating that most of the fallen soldiers were old members of the late local rifle club, which has been disbanded through so many enlistments. The planting of the last tree in memory of soldiers who had answered the “Last Post” was pathetic, a mother publicly planting a tree in memory of her son – Private Charles Ponting. Here Rev Mr. Kelly’s sympathetic remarks were most helpful and needed. At each tree a verse of the National Anthem was sung, Mrs Jones leading. An adjournment was made to the state school ground, where Mr. Parry planted the “thrift” tree, Warden Parry concluding the ceremony in an appropriate address. Many residents of the surrounding districts being assembled refreshments were provided in the parish hall. The proceeds (about £2) are to be passed over to the Red Cross Fund. The state school scholars were in attendance, marshalled by Mr. Pratt, the head teacher. Where the two donors of the trees, Messrs Archer and Lawrence, planted two trees in honour of Private Clarence Lee and Driver O Hemphill respectively. The proceedings terminated with the singing of the National Anthem and “God Bless Our Splendid Men,” and three hearty cheers for the boys at the front. The Warden thanked Mr. McCabe for the music supplied by the band. Afternoon tea was served by the Red Cross Branch in the Anglican schoolroom. the tables were arranged with spring blossom. Those who assisted were Mesdames Stokes, Hudson, Stewart, Cox, Abrams, Pinkard, T Lee, Misses Whitfield, Lovett, Gould, Affleck, Thomson, Gibson, Ferguson, Stewart, and Richardson. Roll of Honour in State School, and Avenue of Trees in Town. Carried out by free subscription. On Saturday a large number of people assembled on the Recreation Ground for the purpose of planting trees in honour of our fallen heroes. Nine trees were planted. To be erected early in June 1920. This will take the form of Honour Roll and funds are being raised by subscription from children and Parents. The School being the only public building the Roll will be placed there. The Proposal originated by children and teacher at the local school. Memorial trees will also be planted on Arbor Day in the School Grounds. At yesterday’s meeting of the New Norfolk Council it was decided to plant an avenue of trees at National-park, and to call it the Soldiers’ Avenue, in honour of the soldiers who have enlisted from the municipality. A circular was also read from Captain Ogilvy, hon. actin organising secretary to the State recruiting Committee, suggesting that, as the planting season was approaching, an avenue of trees should be planted to commemorate the names of those in the district who responded to the Empire’s call for help in her fight for liberty and justice, and that a tree should be planted and reserved in commemoration of each Tasmanian who enlisted. It was decided to concur with the petition with respect to the recreation ground reserve, and the clerk was instructed accordingly. Councillor Nicholson asked who would bear the expense of the avenue? The Clerk: The cost will be raised by public subscription. The resolution was then carried. A public meeting is to be held in the hall on Tuesday evening, the object being to arrange a working committee for the planting of memorial trees to fallen soldiers. It is to be hoped that every soldier serving his King and country will be represented by a relative or friend. The ground will require cleaning, levelling, and ploughing ready for planting and the erection of tree guards. H J Saltmarsh, North Motton, wrote asking permission to plant an avenue of trees on the side of the road in North Motton in memory of our fallen heroes. Permission was granted. It was stated in support of the application that the portion of the road where it was proposed to plant the trees was eminently suitable. A public meeting was held in the hall on Tuesday to make arrangements for planting memorial trees for fallen soldiers. A good number of residents were present. Mr Guthrie presided, and it was decided to apply to the Leven Council for permission to utilise that piece of land opposite the hall, which is suitable for the purpose. On Saturday afternoon a large number of willing workers came along and soon got to work, and the cleaning, grubbing and carting away of the rubbish proceeded quickly. The accumulations of nearly half a century was carted away, and then the ground was ploughed and is now ready for planting. Amongst the workers were Messrs. W Brett, G Delaney, N Thompson, A Mantach, R Shadbolt, G Hutton, C Johnstone, J Chilcott, A Brothers, P Hall, G Bennett, W Deacon, E Murray, H Saltmarsh, D Guthrie, G McPhail, H Dodery, and L Tongs. Mr R Shadbolt brought a team of bullocks with him and did good work with them. Messrs Saltmarsh and Guthrie each brought a plough and team. The young ladies provided afternoon refreshments, which were much appreciated. It is not yet decided what variety of trees is to be planted; that item is left to the secretary and chairman, the Norfolk Island pine being favoured generally. A collection was taken up to defray expenses and the balance devoted to the tree avenue for fallen soldiers. A working bee took place at North Motton on Saturday afternoon for the purpose of clearing the roadside preparatory to tree planting. A large and representative gathering was present at the appointed hour with mattocks, spades, and other implements, and a complete alteration was effected by the gang of willing workers. Afternoon tea supplied by Mrs Wood was appreciated. … Immediately in front of the hall, on the opposite side of the road, is the Soldiers’ Memorial Avenue, along which trees were recently planted. Each is a memory, marked with the name of a “soldier brave and true” who enlisted from the district for service in the Great War. For a long time it has been apparent that the trees, a variety of spruce, planted some years ago as a tribute to the men of the district who enlisted for service in the great war, are unsuited to local conditions. The trees, which are on the main road, and extend in a row from opposite the post office to beyond the school, have, in the course of years, made very little progress. In response to a petition prepared by Mr. H E Boon, and signed by t he requisite number of rate-payers, a well-attended meting convened by the Warden was held in the North Motton Hall on Wednesday, Cr. Viney presiding instead of the Warden, who was unavoidably absent, and on whose behalf Cr. Viney tendered an apology. It was unanimously agreed that the trees should be replaced by a variety more suited to the situation, and to that end the council is to be asked for permission to replace the existing trees with a suitable flowering gum. An executive committee, consisting of Messrs Boon, Gillard and Greaves was elected, together with a general committee. If possible the planting of the new trees will be done by the boys of the State school as the Arbor Day ceremony for this year. The head teacher (Mr. W T Greaves) agreed to co-operate in a plan suggested by Mr. H E Boon, whereby a number of the trees will be cared for by school boys, a record to be kept of the names of succeeding boys caring for each tree. A number of those present each promised to donate at least sufficient to purchase a tree, and Mr. Boon’s offer to collect donations towards the expense involved in purchasing and guarding the trees was gratefully accepted. Mr. Boon would be greatly helped in his task if residents who are sympathetic with the movement would forward donations to him. A meeting of the committee in charge of the re-planting of the Soldiers’ Memorial trees was held on Wednesday night, when it was found that much progress had been made. It was reported that cash donations were coming in freely, in addition to which Mr. J. Chilcott had donated 100 droppers and Mr. H. J. Saltmarsh the necessary straining posts. Application to the Education department by the head teacher resulted in permission having been obtained for the alteration of the local school celebration of Arbor Day to coincide with the committee’s arrangements for planting. At this ceremony the RSSILA, Druids and other organisations will be represented. A working bee to prepare the ground and erect the fence has been arranged for Friday, June 22. It is hoped a large number of helpers will attend. A meeting of the committee which managed the re-planting of the trees in the Soldiers’ Memorial Avenue was held on Friday night. Mr. H. Boon presented a statement, which showed that the scheme had cost about £10. After all accounts were paid and the surplus material sold a small balance was in hand, sufficient to meet such small expenditure as may be expected for some time to come. Messrs. H. Boon, S. Gillard and C. Viney were elected a committee to watch over the avenue, with power to expend such amounts as may be necessary from time to time to keep the avenue in order. Gratitude was expressed toward the Leven Council for a donation of £2/2/, and the undertaking by the council to keep down undergrowth on the area. Votes of thanks to donors and others whose voluntary efforts made the carrying out of the plan possible were carried. Our Nubeena correspondent writes: - A large number of people recently assembled for the purpose of planting the soldiers’ avenue. Fifty-one trees were planted mainly by lady relatives of the soldiers. The Warden spoke to those assembled before the planting, and the Rev. Mr. Way offered prayer. The trees in memory of those that had fallen were planted first, the names of the men being: - Harold Rumney, Horace Calvert, William Free, Vernon Batchelor, Norman Greatbatch, Lynn Joseph, Albert Curran, Louis Johnson, J. Dyson Lacey, Paul Joseph, John Stacey, and Sydney jack. The names of the other soldiers in whose honour trees were planted were: - Robert Stacey, T Stacey, W Stacey, A Stacey, T A Stacey, E Rumney, G Clarke, E Price, R Hurd, M Crosby, J Curran, T Curran, E Martin, W Thornton, C Spaulding, F Shackcloth, D Wakeling, T Spaulding, J Batchelor, T Clarke, W Mundy, C Rumney, W Newbon, L Greatbatch, C Dodge, E Benjafield, Bert. Spaulding, D Spaulding, H Hansen, A Johnson, J Burgess, F Frost, C Kingston, G Robinson, Hector Free, J Plummer, F Wade, T Fazackerly, T Good. The working bee on the previous Saturday was a great success, the land being cleared, ploughed and harrowed, and the holes dug, Great interest was taken in proceedings. So far no date is fixed for the planting of the trees in memory of our fallen soldiers. Many Ouse and Hamilton residents assembled at the Post Office to take part in the ceremony of planting trees to the memory of our fallen soldiers. Mr. A S Cook, the hon. secretary of the movement had all in readiness, and the day was fine. Archdeacon Whitington journeyed from Hobart, as did also Lieut. Jones, the latter to represent the Returned Soldiers’ and Sailors’ League. The archdeacon addressed the people assembled. Lieut. Jones spoke in feeling terms of the sacrifices of the many fallen comrades. The teacher (Mr. N O Ives) marched the schoolchildren to the Post Office. The hymn, “O God, Our Help in Ages Past,” led by the scholars, and the singing of the National Anthem brought the proceedings to a close. Trees were planted by the relatives in memory of the following: - Charles Heawood, Oscar Heawood (brothers), Lance-Corporal Henry Nicholas, Oliver Brown, Frank Cashion, John Wrigley, Hector McCarthy, Roland Saunders, Lieut. Campbell, Charles Pearce. A willow tree was planted by returned soldiers to commemorate the victory of the allies. Afternoon tea was served in the library. The proceeds of the tea are to be devoted to the Red Cross funds. The ceremony of planting trees along the Ouse township part of the main road to perpetuate the memory of fallen soldiers took place last week. The parents and relatives of the fallen, together with a very large gathering from all surrounding districts, assembled at the post office, awaiting the arrival of the Warden (Mr. F C K Pitt), Archdeacon Whitington (senior chaplain), Lieutenant Jones (Returned Soldiers’ and Sailors’ League), the council clerk, councillors, and other prominent citizens in Hamilton municipality. These arrived at 4 p.m., after the tree-planting ceremony at Hamilton. The Warden asked the chaplain to address the assemblage. The Archdeacon said it could not be denied that the war was not of our making, and that the British Empire was fighting for a very righteous cause. The gallant lads who had fallen, by giving their lives ungrudgingly for this great cause, had paved the way for final victory, which they all felt was now clearer in sight. As an Australian, he felt extremely proud of the fact the Australian lads had achieved such great military honours; and it was a special privilege for him to be present at this function of tree-planting which was to perpetuate their memory. Lieutenant Jones referred to the light – heartedness of our soldiers, and how they went cheerfully into action, and those who came were still cheerful, despite their wounds and trials. He especially drew attention to the splendid characteristics of the Australian womenfolk in the great sacrifice. They were brave to the last. The tree-planting was only the outward sign; hew anted the people to think of these fallen lads from their hearts, and never forget that they had helped to clear the way towards final victory to ensure a lasting peace. The hymn, “O God, our help in ages past,” the National Anthem’” and “Our Men,” were sung by all present, the scholars of the State-school participating. The secretary (Mr A S Cook) and his committee had everything in readiness, and the trees were planted by the relatives of the fallen men. Lieutenant Jones also planted a special tree to commemorate the Allies’ victory of the last few days, as the objectives they had achieved would, he said, finally lead up to victory. The Warden initiated the idea of tree-planting, and his committee worked hard in making the arrangements. The ladies of the Ouse provided afternoon tea, which was served out in the Library-hall. The proceeds, amounting to £2 16s., are to be devoted to the Red Cross Fund. The ceremony in connection with the soldiers’ avenue at Carnarvon took place on Saturday and was of a most impressive character. The avenue is n memory of the soldiers belonging to or having near relatives in the district who have made the supreme sacrifice, a tree being dedicated to each. The names of the men are Corporal Gordon Blackwood, Private A r Cahill, Private W Davis, Private L Johnson, Private T Smith, Private R Taylor, Private A Woolley, Private T Burton, Private James Boden, Private L Hawkins, Private F McGuinness, Private G Seabourne, Private A Wright, Private T Mason, Major O Woods, Private T Dale and Private C Clayton. The avenue was further extended by planting trees also in honour of those serving or who have served at the front, their names being Gunner R Blackwood, Corporal E Liddle, Private W McGinness, Private C McArthur, Private J McArthur, Private G McArthur, Lieut Albury DCM, Sapper T Burton, Private W Davis, Private J Riley, Private Jos Ray, Private M Wellard, Private W Mason, Private E Cotton, Private H Shreeves, Corporal E A Targett, Private R Seabourne, Private E Tyler, Private J Fitzgerald, Private Tas McGuinness, Private V McGuinness, Prior to the planting the Rev. Mr Wilson conducted divine service in the hall, a large congregation attending. On assembling at the avenue, Mr John Blackwood (chairman of the avenue Committee), after apologising for the absence of the Warden of the district, who was unavoidably prevented from attending, delivered a sympathetic and eloquent address. The hymn, “Abide with Me”, was then sung by the assemblage, after which the planting of the trees by the soldiers’ relatives was reverently proceeded with. The whole of the proceedings reflected credit on the large and hardworking committee, which had been formed under the leadership of Mr John Blackwood as Chairman and Mr A Connelly as hon. secretary. Councillor Smith referred to good work done by the Parents’ Association and others on the occasion of the official opening of the ground, and he had very much pleasure in moving, on behalf of the Council, a hearty vote of thanks to the ladies who provided the afternoon tea, the Parent’s Association, the Queenstown Band, the school teachers, Area Officer V O’Halloran, the soldiers who had planted the memorial trees to their comrades who fell in the war, and to each and everyone who had assisted in any way in making the opening of the ground a successful function. This was seconded by Councillor Paice, and carried unanimously. Many residents of Deep Bay and surrounding districts assembled at the local hall to take part in the ceremony of planting trees in memory of fall en soldiers. Mr Marsden spoke in feeling terms of the boys that had given their lives fro King and country. Trees were planted by relatives of the following;- Sergeant Cyrus Ladde, Privates Charles Cowen, Percy Heatherbell, and William Challis. The singing of the “National Anthem” closed the proceedings. Afternoon tea was then served in the hall. Description of Empire Day celebrations particularly unveiling of an honour roll “to noble lads who had passed through the school, but who had since given their lives’ for their country’s sake. In carrying out this ceremony, Pastor Heaven first gave an impressive address, and as Miss Dorothy Shepheard removed the Union Jack by which the roll was veiled, the Dead March was played on eth school organ, and as this ceased “The Last Post was sounded by Mr Arthur White. After the unveiling of the roll a number of trees were planted to the memory of the brave Anzacs. After the tree planting both scholars and visitors were served with a bountiful dinner, the rest of the afternoon being spent in sports and games for the children…. The members of the Progress Association were responsible for an interesting ceremony on Saturday, when a large number of residents and visitors assembled in the railway reserve (which has been leased to the association) for the purpose of planting trees in honour of fallen heroes. The president (Mr. Kennedy) outlined the work taken in hand since the formation of the progress movement in June. The promise of a silent cabinet and new side fence for the school; the opening of a branch of the Commercial Bank on Saturday morning; securing the lease of railway reserve to convert into a beauty spot, and serve as a recreation ground for children and other residents; and the assurance from the Commissioner of Railways that the present unsuitable name of Ringarooma Road would be in six month’s time be changed to Kaye. The trees to be planted were in honour of men who had given their lives for the cause of justice, liberty, and right, in the defence of their country, to keep the old flag flying. Next season other trees would be planted to improve the appearance of the district. The Warden (Councillor Auton) addressed the gathering, expressing gratification at being present when honour was being conferred on brave soldiers who would return no more. He congratulated the association on the progress already made, and wished it success in the future. The leasing of the reserve was a wise step, and the improvements effected would soon convert it into a beauty spot and pleasure resort. Mr. Scott in responding to the Warden’s speech happily expressed himself in his desire for the welfare of the district and his appreciation of the Warden’s visit. Seven trees were then planted in alphabetical order. As the names were called by the president, a near relative or friend stepped out and held the tree in position till it was securely planted. The soldiers honoured were Alan Andrewe, T Edwards, William Hyde, Robert Jenkins, John McDougall, George Peddle, J Riseley. Mrs Auton then planted a tree in remembrance of Gallipoli, where the Australians made for themselves an undying name. Mrs Scott followed with one for the Anzacs, whose memory will indeed remain forever green. As rain was falling heavily an adjournment was made to the hall, where sumptuous afternoon tea was served by the ladies. The Branxholm Band charmed everyone by its splendid playing, although not in full strength, and the kindness of the members in being present was acknowledged. Mr. Diprose moved a vote of thanks to the ladies for their assistance. The valuable assistance rendered by Mesdames Scott and Andrews was recognised. Ringarooma Road, N. E. Tas, Oct 2. Out of its very small population, the little district of Rokeby contributed nineteen men to the fighting forces of the Empire during the Great War, and on Saturday afternoon an avenue of trees was planted in the township as a memorial of the men who answered their country’s call. The trees were planted on either side of the roadway leading from the main road through the township to St Matthew’s Church, and along one side of the recreation ground, and should in future years form a very beautiful avenue. The ceremony of planting the trees was performed in the presence of most of the local residents, and there were also present, the Rev H C Brammall, the Warden of Clarence (the Hon Jas. Murdoch MLC), Councillor G W Allwright, Councillor H F Paul, Councillor O G Morrisby, and the council clerk (Mr Geo. Bignell). J Branley, C Buck, B Lazenby, and A Pearsall (all killed in action), W Free and E Haynes (both died of illness), W Sutcliffe, G Stanfield, D Stanfield, J Smith, O Smith, E Gill, T Garland, E Percy, H Thorn, G Reeves, D Chipman, J Harrison and G Johnson. The trees in memory of the men are American planes. At the end of the Avenue there are to be planted two English oaks, one to perpetuate the work of the Red Cross, and the other to represent peace. The cost of the avenue has been defrayed by public subscription, the collecting and other arrangements being carried out by the ladies of the Rokeby Red Cross Circle, with Miss Hookey as secretary, and Mrs Albert Chipman as distributing secretary. A good deal of the timber for the substantial guards with which the trees are enclosed was given, and the posts and guards were made by Messrs Albert Chipman, G Free, J Beard sen., and F Luckman. A number of other residents formed a working bee and dug the holes for the trees on Saturday afternoon. After the trees had been planted, all present adjourned to the Rokeby-hall, where refreshments were provided by Mrs E P Free and the ladies of the Red Cross circle. The Scottsdale Town Improvement Association has decided to plant a soldiers’ memorial avenue, in which the names of soldiers are to be placed. The avenue is to be planted in George St, from what in the early days was known as Tucker’s Corner, along the Bridport road towards Jetsonville. The people of Scottsdale are planting an avenue along George-street from Hale’s Corner towards Bridport in memory of the men who have enlisted from the district. This is to be called the Soldiers’ Avenue. Each tree has a guard round it. A tree will be planted for every soldier, and the name of each printed on a plate. Where two or more have enlisted in one family both names appear on the plate. Some people who have three or four sons or other relatives at the war are planting two trees. Each tree costs five shillings; this sum of course, goes towards planting, fencing and looking after the trees. 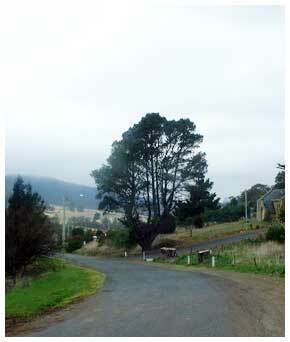 Trees will be planted along the proposed memorial avenue at Snug by the Kingborough RSL sub-branch. Expert advice will be sought on the most suitable types of trees. The proposed avenue will extend eastwards from Davis Rd along the reserve to Station Rd. The co-operation of landholders will be sought to establish an avenue 50ft. wide and 440 yds. long. It will be lined on each side with evergreen trees. The memorial line of trees along the Main Road leading from the Taranna Jetty. At the June meeting of the Westbury Council a circular letter from the Recruiting Committee, Hobart, suggesting the planting of an avenue of trees to commemorate those who enlisted for the war, was read, accompanied by a letter from the Westbury Tourist and Progress Association, to whom it had been referred. The association notified that it was in sympathy with the movement, and suggested planting the main road. The council did not favour a continuous line on the road sides, and resolved to donate the sum of £10, being £4 for Quamby war, and £2 for each of the other wards, towards the planting of trees either in the reserves or other suitable places. At the July meeting of the Westbury Council a letter was received from the Westbury Tourist and Progress Association with reference to the proposal to plant an avenue of trees to commemorate the memory of those who had enlisted for the war. The association did not fall in with the council’s decision as arrived at in June, and again asked that a public meeting be called to consider the matter. After a short discussion, the council decided that it did not see any reason to alter its decision as expressed in the letter sent to the association, particularly as some centres had already taken steps to carry out the council’s proposition. An Avenue of Remembrance was dedicated on the South Channel Area School site at Woodbridge on Friday. The avenue will have 53 trees, one for each person who enlisted from the Channel. Cr O B Cripps welcomed the Minister for Land and Works (Mr Brooker) and the Rev N Elliot, representing the RSL. A brass memorial tablet was unveiled by Mr Brooker. Sixteen trees were planted this year. It is the committee’s aim to have the avenue completed within two years. Mr M J Potter was organiser. …. Trees … The matter of a soldiers’ avenue was mentioned, but it was thought very little could be done in this direction this year, as it is the aim of the association to make the work worthy of the cause. Several trees will be planted around the town however. Trees and tree felling have loomed largely in the activities of the Progress and Tourist Association during the past few days. In regard to the felling business – one prominent member of the committee calls it ‘fouling’ – a narrow escape from serious injury occurred during the activities of some of its members who were busy blazing the track for the others on the following Saturday. Either the “bee” was exceptionally energetic or the particular tree was not as strong as it looked, for after the “bee” had given it one or two “foul swoops” it toppled over, and it was not the only thing that fell at the same time. Beyond a few nasty bruises the other victim of the felling incident escaped injury, and lives to “fall” another day. The Returned Soldiers’ Association has handed the secretary 7/8s for one of the trees to be planted along the Main road. Four more are wanted, who will follow on? The progressive members of the community will make another contribution to the park improvement scheme this afternoon, and invite all those who take pride in the town to assist. “the planting and dedicating of trees forms and admirable memorial and I am glad Wynyard will remember its debt to the past in this way,” said the Governor (Sir Ronald Cross) in a message to the Wynyard Sesquicentenary committee, which commenced its tree planting programme yesterday. Trees were planted in memory of fallen servicemen, the sesquicentenary pioneers and the Royal visit. A military guard came smartly to attention as each tree was planted. The Burnie Marine Board Band played appropriate music. Many people watched the ceremony held on the East Wynyard foreshore, where the first trees on the sesquicentenary committee programme were planted. The message from the Governor was read by the president of the committee (rev A G Costelloe). He said the committee intended to plant 150 trees in East and West Wynyard – one for each year of Tasmanian settlement. Some would be memorials for pioneers of the district, and others for the fallen. In planting the tree in remembrance of the Air Force, Group Captain Pearce reminded onlookers that the tree would represent more than 10,000 dead airmen. Trees for the Navy and the Unknown Soldier were planted by Lieutenant Commander J R Killick and Mr E H O’Brien, president of the Wynyard RSL. Representing the State Government the Minister for Housing (Mr Bramich) planted a tree in memory of the sesquicentenary. In his address he said our forefathers came out from the Mother Country to carve their farms out of the virgin forest. They suffered great hardships. A few scholars of the first Wynyard school were still living, he said, and they were among those descended from the first pioneers. A member of the sesquicentenary committee (Mrs C A Maddox) planted a tree in memory of the pioneers, and the Deputy Warden (Cr A A Flint) planted one in memory of the Royal visit. Cr Flint said the committee and the RSL sub-branch were to be commended for eth excellent work they were doing for the community. Is it a civilised country that we are living in, when, after a group of citizens has done good work for the benefit of the community, others should wantonly destroy this work? This is the question many residents of Wynyard must be asking following the destruction by vandals of guards surrounding memorial trees planted on Anzac Day. The trees were planted by civic and armed services representatives on the day we remember our fallen of four wars. The ceremony at East Wynyard was a solemn one. A military guard stood at attention, and a band played martial music. But others evidently did forget, for only a week afterwards, 10 tree guards were found torn from the ground and destroyed. What an insult to all servicemen – those who came back, and those who did not. What an insult it is to the pioneers, and to our Queen; an insult to all who were at that ceremony, to the sesquicentenary committee, to all true citizens of Wynyard. And how discouraging it is for the sesquicentenary committee, which spent time and effort to make the guards, secure the trees, and arranged for the visit of service chiefs. 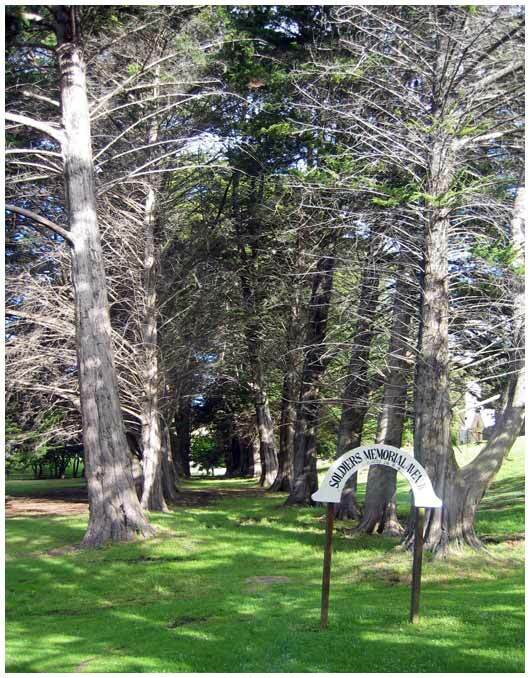 The committee, largely the same as that which made such a success of the town’s part of the Royal visit, embarked on Anzac Day on a scheme of planting 150 trees to form a memorial avenue beginning at East Wynyard and continuing to the western side of the town; 150 trees, one for each year of Tasmanian settlement – or civilisation. It was, and is, a splendid effort, not equalled in Tasmania to mark the sesquicentenary, marred by the action of some who have obviously not reached the jungle stage of evolution. Not only in Wynyard is vandalism present of course. Recently, the Burnie Pex Club’s children swimming pool was put out of action through exactly the same type of action. Should we let it continue? Parents and friends of the lads who donned khaki from this part met at the State School grounds the other day for the purpose of planting trees and erecting guards in memory of those who have died for the cause they have championed and who wholly or in part received their education in the district. Their names are Ptes Murfett, Jeffrey, Moles, Terry and Woods. Hearty thanks were voted to Messrs S Jordan and S Dart and other willing helpers, also to Miss Bell for providing them with afternoon tea. Crs Neal and Hyland made a few appropriate remarks during the tree planting.